Arinsal & Pal are two ski areas which are now connected together after heavy investment in the lift system giving a total of 63 kms of pistes. The resort of Arinsal is the more famous and popular place to stay due to it’s level of accommodation, restaurants and bars. It is a superb resort for beginners and low intermediates featuring gentle slopes and a fantastic ski school. Arinsal is the perfect choice for families and couples especially beginners and once you find your feet you can head over on the cable car to Pal to test some of the scenic tree lined runs Pal has to offer. 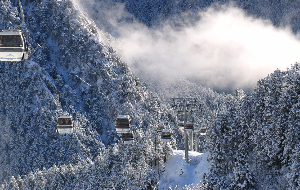 Arinsal has a great range of accommodation ranging from 2 star hotels to 4 & 5 star luxury. 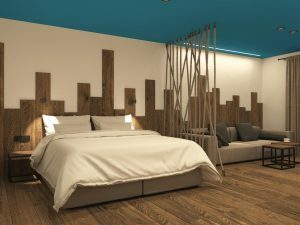 Why not try the new “Ushuaia” hotel which has been completely refurbished to a high 4 star standard during the summer of 2018. Arinsal also has a good range of apartments which would suit both families and groups of friends. For a full list of available accommodation, enter the dates in the search box on our home page. Remember you will get more availability if you stay Sunday to Sunday (7 nights) as well as discounted ski packs. 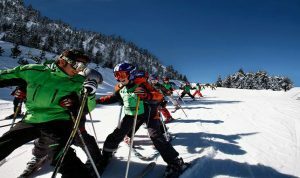 Arinsal is one of the most famous places in Europe to learn to ski in as it has a superb English speaking ski school. You will also find child care facilities on the slopes too making for a relaxing family holiday knowing that little ones are being well cared for. The ski school will quickly teach you the basics so that by the end of the week you can try some of the other pistes Arinsal has to offer or maybe take a trip on the cable car over to Pal.